Bristol Bay is another very popular fly fishing destination in Alaska. People come to the various rivers from all over the world to catch the large Salmon that run these rivers each year. The Fly fishing can be amazing during these runs, and the season is short so you need to plan your trip early while guides are still available and the lodges still have accommodations available. There are many Alaskan fly fishing guides, fishing charters, and fly fishing lodges available to choose from. Salmon fly fishing a very popular sport in the state, and many people travel to the many salmon filled streams every year. If you have never fly fished for salmon you do not know what you are missing. Why not give a fly fishing vacation a try? Bristol Bay is fed by 8 major river systems and is the home of the largest Sockey Salmon runs in the world. Most of the rivers are lake fed and the regular flows provide nice clear water, with normal flows through out the summer. This area boasts to have 44 million Sockeye Salmon return every year. Yes that is million! This keeps the large Rainbow trout busy gobbling up the eggs that are spawned. If you are interested in fly fishing you are best served to go to the upper section of the main rivers that feed the bay. Be aware of the Brown Bear population that lives in these remote and not so remote areas because they like Salmon also. In June the the salmon fry begin heading to the bay area from the upper reaches of the river system. Following them will be a variety of fish including; Rainbow, Dolly Varden and Lake Trout making this a great time to fly-fish the upper rivers. As the little guys head out of the rivers to the bay, the really big fish start coming into the bay in June and don’t let up until millions of Sockeye have run through the bay. By September the Sockeye that made it past the masses have found their resting place. As they conduct their business the Rainbow Trout that feed from the spawn are again a nice attraction for the fly-fisherman. 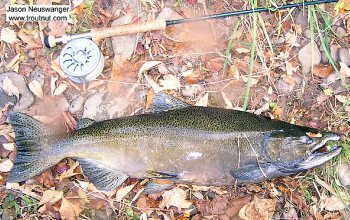 The season finally ends in October with the local Rainbows gorging themselves before winter sets in. The Bristol Bay and its tributaries really has something for every angler from June through October. There are many fly-fishing guides available throughout the state, and they are familiar with many of the rivers. This is what they do for a living and most of them are quite good at their job. They will get you to where the fish are, provide equipment and teach you how to fish form these massive Salmon. Leave the Bristol Bay page and go to Alaska page. Revolutionary Stock Trading Software proven to generate profitable winning trades on Autopilot in only one hour a day. State-of-the-art Artificial Intelligence. Click Here! Very best manual showing how to profit from online or real Casino’s Click Here! Learn how to meet, attract and seduce women -- from a woman. Best selling attraction and seduction guide for over 8 years. Click Here! Make money regardless of whether the market goes up or down. Better that forex, penny stocks, day trading and swing trading. Over 24 hours of video. Click Here! Do you have a favorite river that you like to fish? Maybe a great tactic or special fly that works every time? How about sharing that information with other viewers “pay it forward” by sharing your comments.